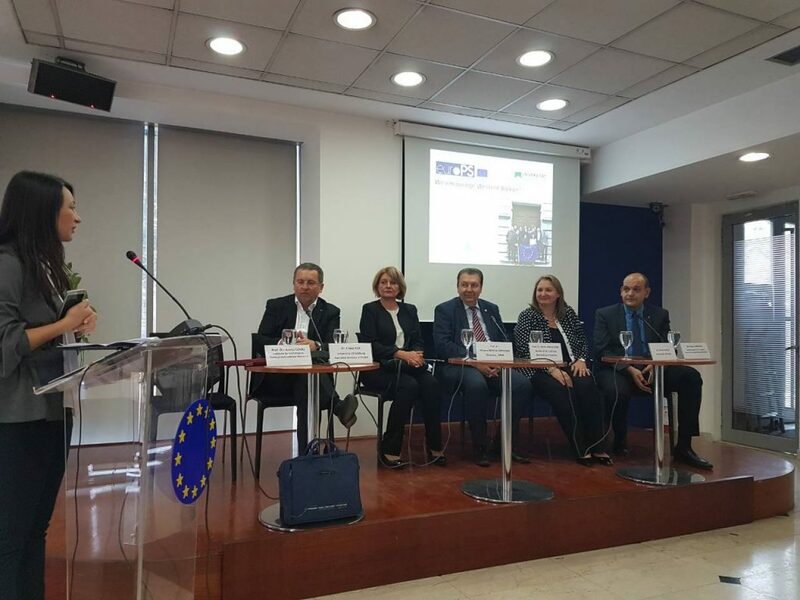 On the 26 th of September 2017, at the premises of the EU Info Centre in Skopje, the Ss. Cyril and Methodius University (UKIM) represented by the Institute for Sociological, Political and Juridical Research (ISRJR) held the roundtable titled “We Encourage Western Balkans” in order to present to the students and other stakeholders the EuroPS project and the Joint MA in Political science- Integration and Governance. At the same time, the event aimed at promoting the values of peace, democracy and solidarity at the 60th anniversary of the European Union. 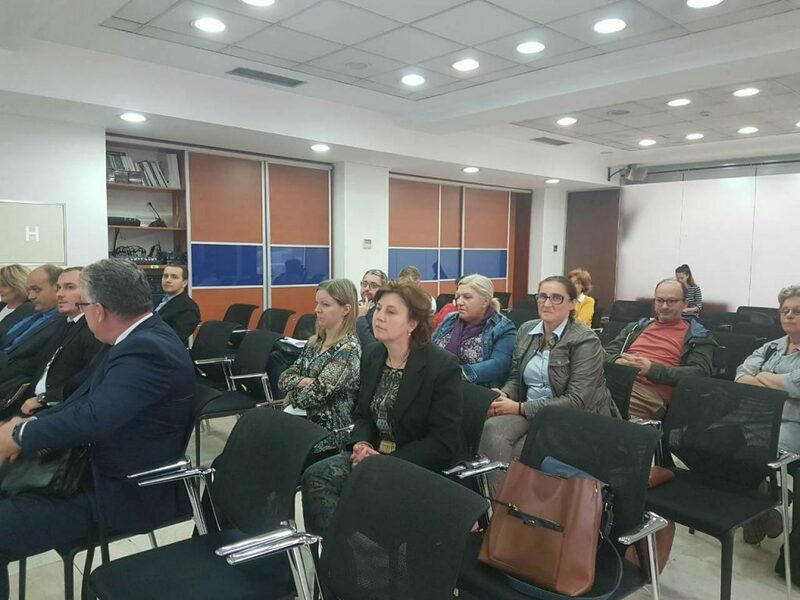 The roadshow brought together students, lecturers, researchers, CSOs and other stakeholders interested in political sciences studies, higher education and Europeanisation of Macedonia. This meeting also served as a platform to promote the excellent cooperation between University of Salzburg and the Ss. Cyril and Methodius University in Skopje. The Austrian ambassador in Skopje, H.E. 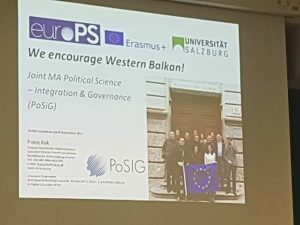 Renate Kobler welcomed the launching of the joint master in Political Science – Integration and Governance (PoSIG), and stressed out the values of peace, democracy, and solidarity. She also greeted the established cooperation between Macedonian and Austrian Universities in the fields of research and higher education and encouraged future joint activities. 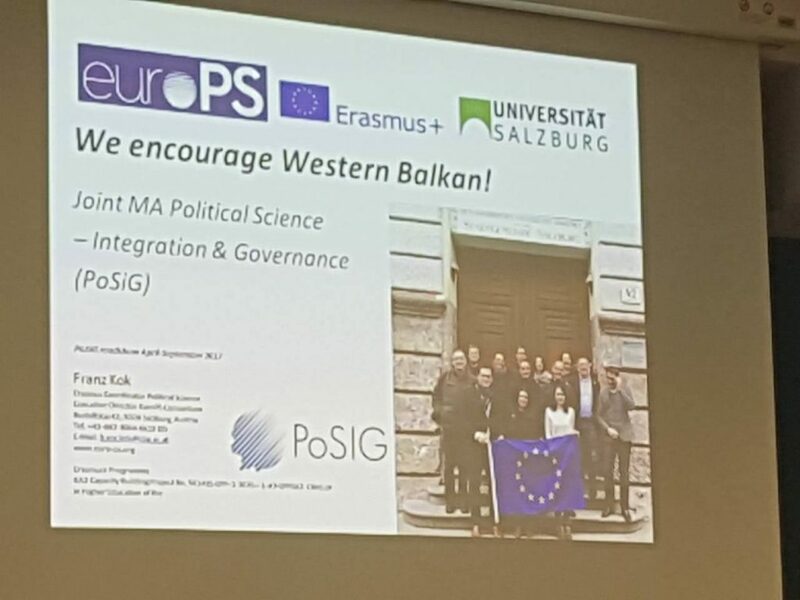 Dr. Franz Kok presented in detail the new PoSIG program, from the initial idea to its accreditation, and stated that such a program is not only significant for the states Western Balkans, but also for the whole Europe. 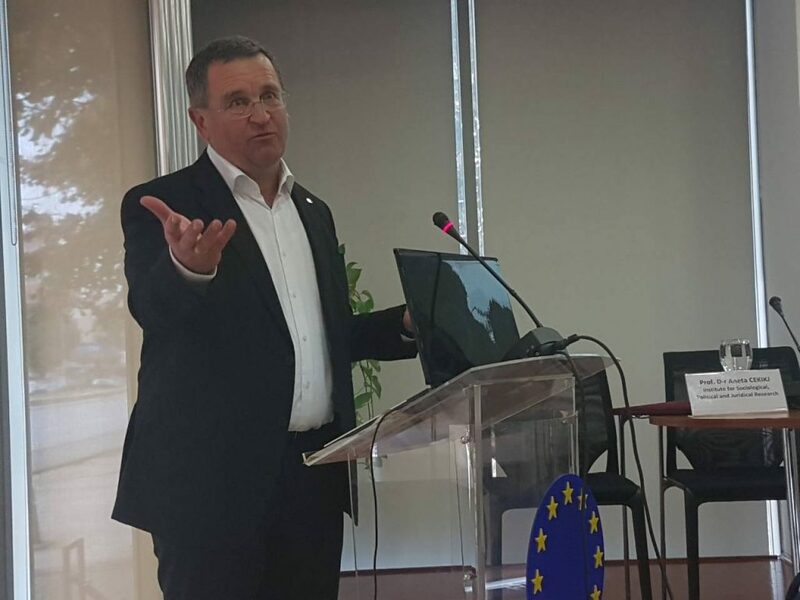 As a pioneering effort when it comes to implementing the European approach for accreditation of Joint programmes, Dr. Kok also presented the experience of the consortium with the European accreditation and the future plans of the partners for work in this area, among others. The Director of the ISPJR, prof. d-r Mirjana Borota Popovska stressed the significance of the project for the institution and said that PoSIG students will be welcomed to benefit from Institute’s expertise in the field of scientific research, and apply modern research methodology in studying the contemporary political phenomena. She mentioned that the first master level studies in Political science in Macedonia were established in 1967 precisely at ISPJR, and that up to now around 800 students have obtained their MA degrees at the Institute in several social science disciplines. Finally, the Director of the National Agency for European Educational Programmes and Mobility, Mr. Darko Dimitrov emphasized the added value of the Erasmus+ programme because it promotes domestic and international cooperation, and encouraged the consortium partners to continue working on future Erasmus+ projects, for what it offered the assistance from the Agency, especially to the Macedonian partner.